Vijayaraghavan's Cricket Blog: Champions League 2010. Day.5. Match.7. SA Redbacks vs Mumbai Indians. Champions League 2010. Day.5. Match.7. SA Redbacks vs Mumbai Indians. SA Redbacks 182 for 5 smashed their way to a possible semifinal spot, with a five wicket victory over Mumbai Indians 180 for 7. You may call it curtains for Mumbai Indians after their second successive defeat in the Group.B match played at Kingsmead, Durban. Batting first, Mumbai Indians lost their way in the initial twelve overs, making just 79 for 4 wickets in the 13th over. 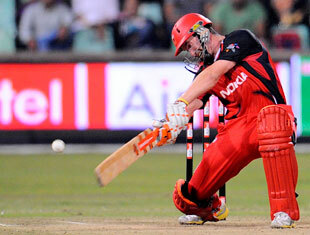 An avalanche hit the Redbacks thereafter and 104 runs were added in just under eight overs. Rayudu 38 of 43, Tiwary 44 of 36, Pollard 36 of 36 and Bravo 22 of 21, contributed to the innings in which ten sixes were hit. The six of Pollard would have made any golfer proud, going over 120 meters and out of the stadium. O'Brien 2 for 44 was supported by Tait 1 for 27, Putland 1 for 24, Christian 1 for 37 and Bailey 1 for 30. For Mumbai Indians, it was a case of missed chances. Dropped catches in plenty, Sloppy fielding, unimaginative field placements & very poor bowling, let them down. Cashing on four dropped catches, the first wicket pair of Klinger 50 of 62 and Harris 56 of 57, put on 112 runs in 13.3 overs. Some of the chances dropped by Tendulkar, Tiwary and Duminy were school boyish. Borgas 14 of 16 and Cooper 19 of 8 finished the match in 19.2 overs. A good victory for Redbacks. On the Mumbai Indian front, the team with an awesome bowling power on paper, turned out to be novices in practice. Zahir Khan and Harbhajan Singh the bowlers expected to lead India in world Cup 2011, just had no clue in bowling the last two end overs, conceding 27 runs and the match. Malinga 2 for 22 and young Murtaza 2 for 29 were the pick of the MI bowlers. Srikanth & Company, are you following the matches and the Indian bowling strengths particularly ? ?